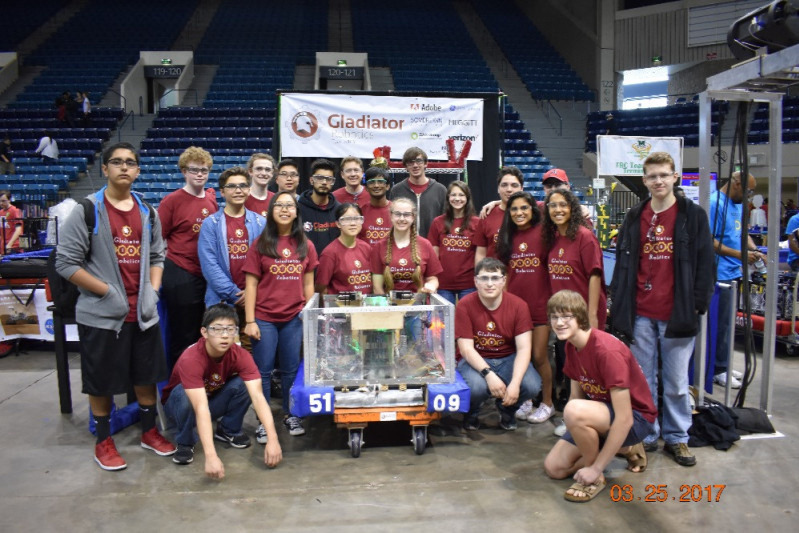 Fundraiser by Gladiator Robotics : Help Inspire Students in STEM! Help Inspire Students in STEM! We are a high school organization whose mission is to develop students’ passion for fields involving STEM. Our organization teaches students how to code, computer design robots, fabricate and assemble parts, work together as a team, market and sell ideas, and most importantly, we show students how to have fun and work hard! There are many aspects that make our team unique, but what we’re most proud of is our diversity. We reach out to all students of all backgrounds and grade levels and especially those with no prior experience. We also host substantially lower student registration costs. The combination of these two factors allows all students – including those who aren’t confident with STEM - to explore and learn robotics (Over 60% of our team is comprised of new members!) and be a part of the truly life-changing experience that we offer. In addition to developing our own skills, we reach out to local elementary and middle schools to support their STEM programs too! We impact the lives of students and teach life-long skills that allow our students to grow as scientists and individuals like no other organization in high school, but none of this is possible without the support of amazing parents, local businesses, and YOU! We NEED any and every donation, no matter how small; so if you have a few minutes, we would be delighted if you could donate towards our gofundme! Additionally, If you are employed, we would be immensely grateful if you could ask your company or send us the details of the appropriate person to contact for a sponsorship - It doesn’t matter whether you work for a local corner store or a large corporation, we NEED your help right now! It is with YOUR support that we can make this difference in our community. To show our gratitude, your company’s name is represented on our robot, shirts, website, and so much more with the appropriate contribution level! If you have any questions, please email us at jchsrobotics@gmail.com. We look forward to hearing from you and we hope you enjoyed learning about us!